Tag line: "Trapped in the limbo between life and death, there are only two ways out"
Despite having very few films to his credit, director Gary Sherman's resume is quite impressive. Aside from the ultra-gritty 1982 exploitation flick, Vice Squad, he also helmed the spooky Dead & Buried, as well as Wanted: Dead or Alive, a 1986 action movie starring Rutger Hauer (an overlooked gem, in my opinion). But, unfortunately, not even Gary Sherman could save Poltergeist III. As the movie opens, Carol Ann (Heather O'Rourke) is living in Chicago with her aunt Pat (Nancy Allen), who's new husband, Bruce (Tom Skerritt), is the manager of the high-rise apartment building they call home. The three live in a luxury suite with Donna (Lara Flynn Boyle), Bruce's teenage daughter from a previous marriage. To help her come to terms with the events of her past, Carol Ann is being counseled by Dr. Seaton (Richard Fire), the psychologist at the school she attends. Convinced she has psychic abilities, Dr. Seaton forces Carol Ann to talk about her ghostly experiences, and in so doing, unwittingly helps the evil Rev. Kane (Nathan Davis) track her down. Aided by her old friend, Tangina (Zelda Rubenstein), Carol Ann faces off against Kane, who's even more powerful than he was before. 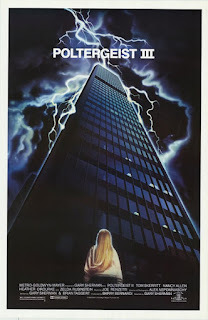 Poltergeist III isn't a total failure. Along with its solid cast and a few creepy scenes involving mirrors, the movie also has some decent special effects. Unfortunately, the negatives outweigh the positives. For one, the theory put forth by Dr. Seaton, that Carol Ann is somehow "hypnotizing" people, causing them to see what she sees, is laughably ridiculous. Never once did I buy that a psychologist, professional or otherwise, would suggest something so ludicrous. In fact, from start to finish, his character is completely unbelievable, a problem I attribute more to the script than Richard Fire's performance. This same script also lets down Zelda Rubenstein's Tangina, one of the two performers (along with O'Rourke) to appear in all three films, giving her nothing more to do than utter Carol Ann's name about a hundred times. But the real issue I had with Poltergeist III was its basic premise. As I mentioned in my review of Poltergeist, part of that film's charm was how it made you care about the family at the center of it all, a feeling that carried over (though to a lesser degree) to Poltergeist II. In both movies, the Freelings were a tight-knit family, with the parents (played by Craig T. Nelson and Jobeth Williams) willing to do whatever it took to keep their kids safe. Poltergeist III asks us to believe these same loving parents suddenly decided to send their youngest daughter, who's already been put through hell a couple of times, to live with relatives. Based on the first two movies, this is something they simply would not do. To top it off, this "new" family unit isn't particularly close. Nancy Allen's Pat, the only true blood relative Carol Ann has, isn't happy to have the troubled girl around, and though Tom Skerritt does a good enough job as the kindly father figure, Bruce, Poltergeist III never establishes why he cares as much as he does (Bruce doesn't share nearly enough screen time with Carol Ann to suggest there's a strong bond between them). By trying to re-write the very formula that made Poltergeist a great film and Poltergeist II an entertaining one, Poltergeist III fails to deliver any of the emotional punch of its predecessors, and, as a result, we don’t give a damn about its characters.